Adelaide have lost to everyone this season. Will South be the first side they beat? 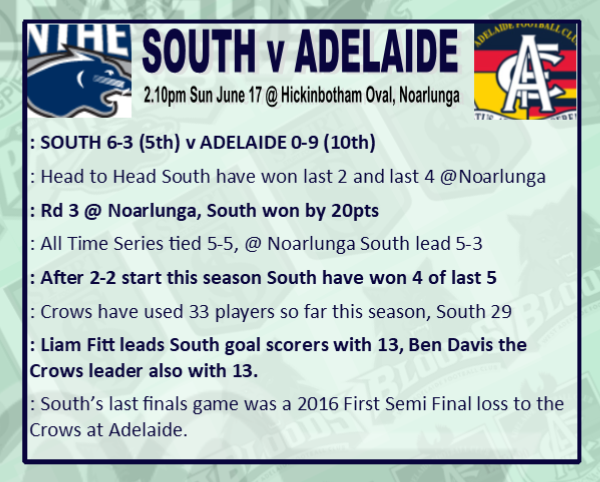 Will South be the first side to beat the Crows twice this season? Panthers with injuries, suspensions and State U/18 duties will take a depleted side into this game. Brooksby,Liddle & Cross will get the Ye-ohs over the line though. Go Panthers! South giving the crows a bath early in second half. A 112 point victory. As a long suffering panther supporter the win was one for the ages, having been on the wrong end of a scoreline like that ,far too many times over the years! The Crows were clearly undermanned and looked lost and directionless. 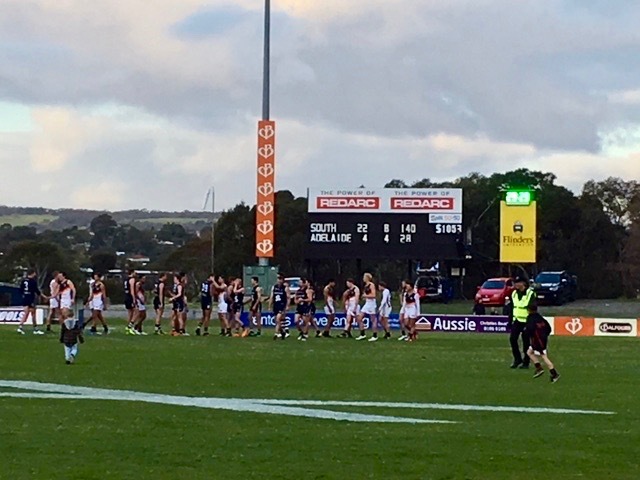 The Crows however kicked the first goal of the game but did not score another major until halfway through the 3rd quarter. Liddle @ Cross basically ran riot with 75 possessions and 7 goals between them. Abe Davis was also very good in attack and Brooksby would be nursing blisters on his hand tonight after 45 hit outs, most of them lace out to advantage. The Panthers also had a couple of late withdrawals through injury and debuted Helyar and Elmes, both juniors from the local zone, both performed well. South are now reaping the rewards of a heavy investment in the local juniors over the last few years....Go panthers! Cross & Lids were taken off half through the final quarter for preservation which was lucky for the Crows as they had 18 disposals between them in 15 minutes. Really pleasing day at the footy and one of the most enjoyable I've ever had! There's people out there who don't attend games with 'AFL' teams to make a statement and that's their choice. Make no mistake, I don't like the situation, but I'm not going to hurt my team through non-attendance and get to be rewarded with seeing such a good four-quarter performance like that. Lids given best on at pressos for the fifth or sixth time this season. Crossy given 2nd best. Special mention was made of Summerton's defensive effort while Brown was excellent on Ben Davis with only a couple touches. Brooksby was absolutely superb - 50 hit outs out of a staggering 90 for the team. Don't have exact figures in front of me at the moment but we were about 50+ in contested possession, 155+ uncontested, +70 hit outs and +25 inside 50s. The two most recent 100+ margins I can recall (Port v West at Alberton last year and Port v Glenelg at Alberton a few years ago) didn't see such lop-sided disposal counts like that (maybe 70-80 different, not 200). Hampton aside, the Crows were absolutely awful today. Granted they were down to none on the bench half way through the third term, but if the conditions weren't crap and we stopped the clock for ball ups, South would have won by an innings and 112 runs. Where can I find a market for the Magarey Medal..? Although the match didn’t resemble much more than a training run it was rather enjoyable to demolish to interlopers. Nick Liddle getting better with age? Having a superb season. Cross and Brooksby again dominated, while Brown continues his strong recent form. A case of all played well. Pleasing to blood a couple more youngsters. South’s first triple figure win since Round 20, 2006 at Unley. We also smacked Port by 100+ that year, which I recall was the first time cars were allowed around the boundary at Noarlunga. On the flip side, South have lost 8 games by 100+ since 2006. Have fond memories of 2006. Beating Glenelg at Adelaide Oval to grab a spot in the finals. Beat Port in the first final. Pretty certain we led North at three quarter time in the semi before being overrun. We averaged 122 points that year. We haven't come within 30 points of that since 1997 (as far back as I could be bothered going). SANFL scoring was up massively that year in part to coaches like Pyman and Jarman playing really attacking footy plus that was the first (and only) year the SANFL stopped the clocks for ball ups, creating at least an extra 15 minutes of playing time.